Samuel “Sam” David Introwitz, 25, of Altoona, WI passed away, Thursday, November 8, 2018 at his home. Sam was born October 16, 1993 in Eau Claire, WI the son of Otto Kolpien and Terri Introwitz. Sam was a very giving person, he always helped everyone. He loved his family immensely especially his son Mahni. He was incredibly strong and faced much adversity throughout his life. Although we are devastated and missing him terribly, we know that finally, he is free. 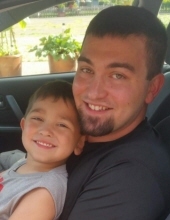 Sam is survived by his children, Armahni David & Ashtyn Ann Introwitz; his mother, Terri; his siblings, Zachary & Jacob Bahr, Katie Introwitz, Tyson Myers, Jessa Raether; nieces and nephews, Lucy & Ryan Bahr, Jayce Myers; grandparents Marjorie (Fred) Akey-Mahkuk & Duane Introwitz; many, aunts, uncles, cousins, other relatives and friends. Sam was preceded in death by his father Otto. A Mass of Christian Burial will be said at 11 a.m., Friday, November 16, 2018 at St. Mary’s Catholic Church in Altoona. Friends may call on the day from 10 a.m. till the time of service. Interment will be at Trinity Cemetery in Fall Creek, WI. Stokes, Prock & Mundt Funeral Chapel, Altoona is assisting the family with arrangements. Online condolences may be shared at www.stokesprockandmundt.com. "Email Address" would like to share the life celebration of Samuel David Introwitz. Click on the "link" to go to share a favorite memory or leave a condolence message for the family.